One of my favorite Indian dishes is the Vindaloo, a slightly acidic and spicy meat stew from the Goa region in India. 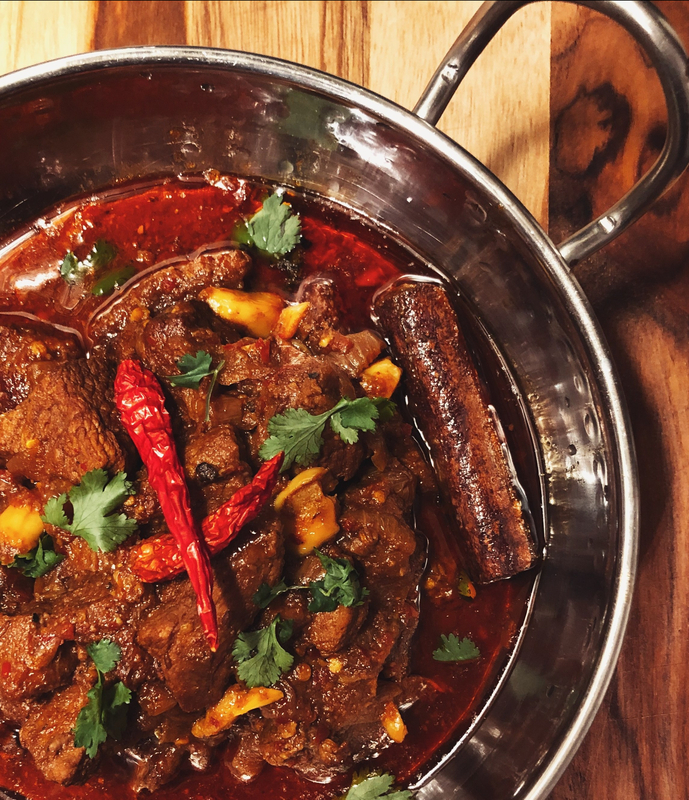 Even though in the western world, vindaloo is just another “hot & spicy curry from India”, the dish is actually inspired by a very popular Portuguese dish, carne de vinha d’alhos, which roughly translate to “marinated meat in vinegar and garlic”. It was brought to the Goa region by Portuguese explorers in the 15th century and after 200 years of improvements made by both Goanese and Portuguese cooks, when the British discovered this dish in the mid-1700s, it has transformed completely. However, when the dish was introduced back to the west, the tang from the vinegar was replaced by tomato sauce to reduce cost, meat is no longer marinated to save time, and the amazing balance of the different spices are lost under a blistering excess of chiles. This Vindaloo recipe is very similar to that used by cooks from Goa, based on an early British India cookbook. The spices provide an earthy flavor that balances perfectly with the tangy-ness from the vinegar, and the heat is detectable, but not overwhelming. Slightly toast the Kashmiri chilies, black mustard seed, cumin, and cloves in a pan, then place it inside of a food processor with the turmeric, garlic, ginger, vinegar, cooking oil and water. Blend the mixture until it turns into a thick paste. Cut the meat into 2inch/5cm cubes, them mix them with the vindaloo paste we just made, cover the marinated meat and place them in the fridge for at least 4 hours, but 24 hours is ideal. Add the marinated meat with all the paste into the same pan, cook for about 10 to 15 min or until the surface of the meat is browned. Then add the tomato paste, brown sugar and water into the pan. Bring it to a simmer, cover the pan and cook for about 1 hour or until the meat is tender. Serve the vindaloo with some warm fluffy rice. And Enjoy!